I think you only need to hear three words before you’ll want to make this recipe. Ready? Bourbon. Chocolate. Sauce. I was originally going to share this recipe as part of a larger recipe, but it’s so fantastic it deserves to stand on its own. I have to be honest and say the bourbon flavor doesn’t really come through, but the chocolate flavor? Whoa. Like liquid truffle. If (when) I make more, I’m going to attempt adding more bourbon just because I like it. 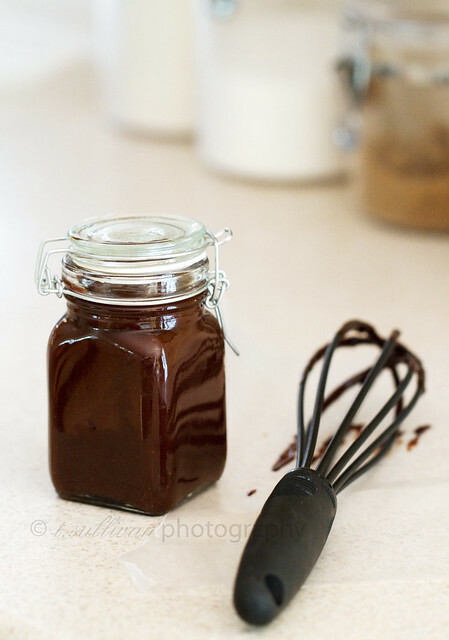 Did I mention this chocolate sauce is almost impossibly easy to make? Heat cream. Pour. Stir. DONE. You can eat it right away or store it for later. I stored mine, but I’m glad no one was around to see me shamelessly lick the remaining chocolate sauce off the whisk, the pot, the spoon and everything else. Not that that would have stopped me, I’m just glad no one had to see that. Use quality block chocolate for this sauce. I used Callebaut 60% dark chocolate.Serve on top of fresh fruit, drizzled into plain Greek yogurt or on top of ice cream, or dip in goodies like marshmallows and graham crackers. Or just eat it with a spoon. I won’t tell. In a small saucepan over medium heat, combine milk and brown sugar. Stir until sugar dissolves and cream just starts to boil. Remove from heat, add chocolate and stir until smooth. Stir in bourbon and vanilla. Serve immediately, or transfer to a heat safe, airtight container and store in the refrigerator for up to a week. To reheat all or part of the sauce, heat in a microwave safe container on DEFROST for 10-20 seconds or warm slowly on the stove top. Oh yum! This would be a great hostess gift as well! My Mother-in-law is a diagnosed (by her family) choco-holic. She already likes me but if I made this I think she’d love me more then her actual son. Hahahah. How strong a flavor does the Bourbon add? I don’t mind but some family members don’t like Rum Balls or anything with an alcohol taste to it. As a certified choco-holic myself, I can confirm that your MIL will love this stuff! :) I really couldn’t taste the bourbon at all – it’s mostly just there to keep the sauce from getting too solid. This sounds so good! I couldn’t be trusted with a container of chocolate sitting in my fridge. I would be sneaking spoonfuls of it all day long! I look forward to hearing about the recipe that goes with it. Oh interesting!!! I’ve never heard of a recipe like this – it looks like a great one though! Ohhhhhh, that sounds really good!